I am bathed in sunlight on a remote landing strip in Northwest Zambia. Rumor around here is that the strip will be shuttered and replaced by a new paved runway about 30 kilometers downstream, in a spot closer to a proposed mine on the west bank of the Zambezi. Of course, rumors like these abound in any community: I heard there’s a new mall coming to Hillsboro; if Boeing goes to South Carolina, …? It seems in most places that implications of our livelihoods carry an undue weight in describing the value of our lives. And Zambezi is no different. For the first two years I came here, I heard about the Shoprite coming to town and the bridge that would eventually replace the decrepit pontoon ferry that offers vehicle passage across the Zambezi. Now it’s the airstrip closing. The narratives change, but narrative remains. And this is one: I am bathed in sunlight on a remote landing strip in Northwest Zambia. Familiar songs of greeting wash over me, and I am welcomed by old friends and new. Tambukenu mwane. How is America? How is your family?I I respond cheerfully and directly. Mwane vulya mwane. Ah, my country is making every effort to destroy itself. My family is good; my son is two; yes he is a very busy boy, and my daughter is compassionate and bright. I will pass along my greetings. Because of some complications on our first wave of flights, what is normally two main arrival times turns into four, and this ritual of song and greeting is repeated each time. Each time, 24 primary school pupils belt out their songs of welcome and praise for the school’s relationship with Gonzaga. Hello, we welcome you. Hello, hello, we welcome you, Gone-zaga. I’ve heard some version of this song or one of its cousins each time I’ve been to Zambia, and in multiple communities each time. The hospitality of the message, the harmonization of the singer, touches me each time. Each time I have all the feels: the simple joy of a welcome, the sense that I am not grateful enough to burst into song when friends come to visit me, the fatigue and profound tension of being celebrated for work of which I have only been the most minor part. Today, all those feels were multiplied by four, as each plane landed to a repeat of the same routine…wherever we go, we praise Go-zanga. 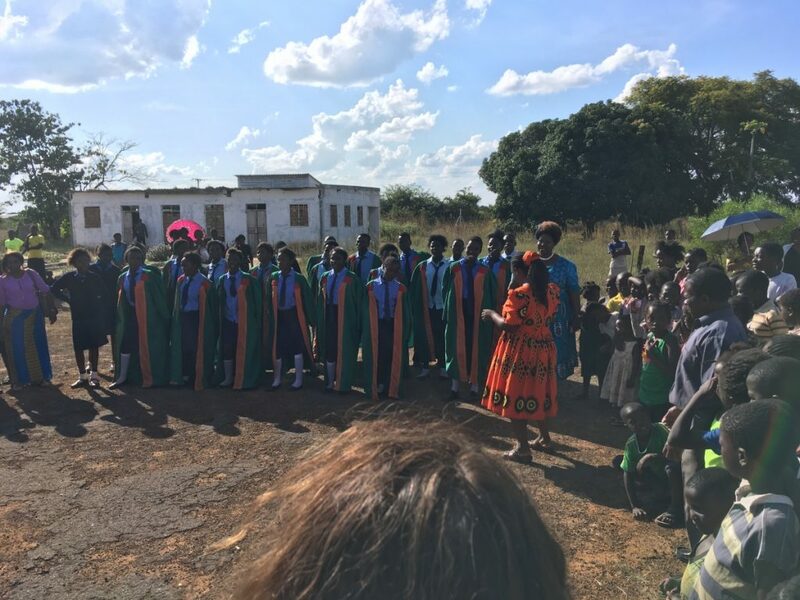 And after all of the singing, the chores, the wrangling of food for the school choir, I took a small group of teachers from the Zambezi airport back to the school at Chilenga. As we set off, the man beside me points to a shortcut through the bush. By the time he tells me, it’s too late to take the next shortcut, so the women in the back seat tell me to go ahead. They each know another route, and argue about which we should take, cutting off the man when he tries to overrule. In some ways, after four trips to Zambezi, I like to wish that I have some things figured out. However, it’s been a long day, a day mixed with many hugs and smiles, and a day in which I’ve questioned whether we deserve the warmth and gratitude extended to us, a day in which I’ve recalled again that I have warrant to question the manner in which another human expresses gratitude, and a day I remembered again a fairly simple truth about Zambia: this a place that continues to offer delight and tension. There are shortcuts, but you’ll inevitably be taking the long way round. And that complexity, the way it helps me to understand the world and my place in it, is why I continue to return. Parents and loved ones, we are here, and safe, and well—if a bit tired. I look forward to knowing your students as they get to know bit-by-bit this community that I’ve grown to love. I can’t wait for you to hear about their experiences through this blog and the many reflections they’ll have on their experience. English Department (and the one who feels a terrific responsibility for getting your lovelies back to you). PS: Ann Burnett: The choir looked spectacular in their new robes, and Jessi Mukumbi was so proud to show them off. Glad to hear you made it after many days of travel. I hope you all continue to receive all the delight and tensions that Zambezi has to offer. Keep your eyes open for new places to visit around town, keep your hands open to greetings with new people, and keep your heart open so that you can process with the people around you. (Rumor has it you’re gonna have a great trip). Hi Zags! Thanks for the update Mr. Dodd! Looking forward to reading each entry in the days and weeks ahead! Be well, work hard, peace to you all. You’ve arrived! Hopefully the convent beds and maybe even the “couches” have provided some much needed rest after your long days of travel. I look forward to reading all of your reflections in the days to come. Thanks for the words, Jeff. The description of “delight and tension” is spot on for Zambezi and many other experiences in life. I hope you all welcome the delight and tension and any other feelings that may come along with your experiences this month. I was going to say to be careful about taking shortcuts (tbt dipalata), but on second thought, TAKE EVERY SHORTCUT. That’s where the adventures and stories await. Anna Yeung- Lyds drove 90min round trip out of her way on her drive home to go to that taco truck y’all went to in Sunnyside, and as a result I got another spontaneous visit. We talked about you and how happy we are for you and how wonderful you are. KP- Hi crazy lady. You are home again. Morgan S.- 1. Best name. 2. Yay Zambezi seniors! It’s weird and hard to leave so soon after graduating. But also, how cool? Thank you for the update. We are so glad and proud that our daughter is going though this wonderful experience. May God Bless and watch over you all! I sure am a sucker for the dichotomies of life, especially the ways in which Zambezi is a teacher/revealer of them. Delight and tension. So good. Keep feeling all the feels Jeff. Zags, you have a such a great advisor/friend/teacher in Jeff–lean on him, follow him around sometimes, and please oh please sass him back. A couple past Zambaes and I were just walking through Manito thinking of how you were currently sleeping (or dancing, or talking, or trying to settle upset tummies) at your home-stays. Know there are so many of us who have walked these paths ahead of you and are now cheering you on from behind. welcome to the yellow walled room zags; may it soon be filled with your laughter, your hard questions, joyous meal times, and whoever joins you along the way! ps. Morgan S, I am so damn proud of you. Sending you so much love. pss. Hannah, you are in Zambezi! I can imagine all the thoughts and questions already filling up your being. Keep asking the hard questions. Cannot wait to hear about and process with you. psss. Kris and Anna, my heart is a happy mess just knowing that this years group gets to have you both. You are love and you are light. I am so happy to hear you all have arrived in Zambezi and are resting safely and soundly in your cozy convent beds. I’m sorry many of you were probably woken up far too early by a friendly rooster this morning, but I think it perfectly symbolizes Zambia’s call to seize each moment of opportunity and face the beauty and challenges each day brings, even if its painful (especially for those of us who don’t like mornings, that is). I have been thinking of you all since you left and I am so excited to keep reading and learning from the lessons and questions you all will kick up in the soft Zambezi sand. Tension and Delight, what accurate descriptors for this place so many of us hold in our heart. Marinate in them, and if you ever need to have a deep talk about these dichotomies, you can always rely on Jeff to choose a wildly unconventional place in Zambezi to chat. Just go with it. Jeffrey, even though my time at GU has ended, I am so grateful I can learn from you from 9,181.65 miles away (yep, Spokane-Zambezi, I googled it), so thank you. In the famous words of KP, look alive lil zaggies. Wishing you all courage, patience, and grace as you embark on your home stays, first Zambian mass, and first week of classes. Rumor has it that Lexi Buhler managed her way into Zambia – my condolences. Oh, the things I would do to wander through those canary-yellow halls again. Fill it with songs, questions, tears, and laughter (if not already). I am so eager to read your words, feel your feels, and experience Zambezi all over again. Hoping you all take on your homestays and the first week of classes with courage, patience, and humility.